SEATTLE - He said he probably wouldn't hit career home run No. 500 last night because "the press conference would be too late and it would delay us getting into Baltimore." But whether Manny Ramírez was kidding or not - and you don't often know which - he was on the verge of one of baseball's greatest milestones. Ramírez hit No. 499 in the sixth inning Tuesday night, a three-run shot off Miguel Batista, and yesterday he said, "Nobody cares about that one. That one's over. Everybody will forget about that one." Ramírez was playful again, telling questioners they should be concentrating on the great play he made in left field - gunning down Adrian Beltre attempting to go from first to third on Kenji Johjima's single in the sixth - rather than the home run. He even said, "That guy [Beltre] probably didn't see the video. I've got a cannon for an arm." When the subject came back to the milestone, Ramírez said, "I'll hit No. 500 and then the Red Sox will give me a pay cut next year." Ramírez and his agent, Scott Boras, have been saying that Ramírez, who will turn 36 tomorrow, would like to play into his 40s. Ramírez has two club options at $20 million per year, but would certainly like something long term. Boras is convinced that Ramírez, if he takes care of himself, could play well into his 40s. And Ramírez agrees. Ramírez's teammates know something special is about to happen, although it didn't happen last night; Ramírez was 1 for 3 in the Red Sox' 1-0 loss to the Mariners. "I'm thinking about my own career and I hit 130 homers. 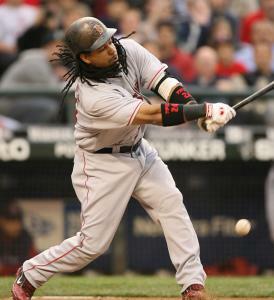 That's 130 times I've circled the bases and it's only a fraction of what Manny has done," said Sean Casey. "Don't forget, I was his teammate in his third or fourth year in Cleveland. He was an unbelievable player then, but to see him all these years later and now being his teammate for this incredible moment, that's special. "I was around in Cincinnati when Ken Griffey [Jr.] hit his 500th, and that was such a special moment. Griff and Manny are different personalities, obviously, but they're both great, great players. Griff, over that 10-year stretch, might have been one of the greatest players in baseball history, but Manny's consistency over time is just remarkable." "It's what he does day in and day out," said Mike Lowell. "He has a plan and he sticks to that plan at the plate. He might take a called third strike just to stick to his plan, but then you see him hit the ball out of the park over right field. That's the thing I've never seen before, the power he has to the opposite field where he can hit home runs that way. For a hitter, seeing that as often as we do, that's what makes your jaw drop." Casey said he has introduced Ramírez to the phrase, "Don't worry about it." "He'll ask me about something and I'll give him the old, 'Don't worry about it,' " said Casey. "So now I'll ask him, 'When are you going to hit your 500th?' and he'll say, 'Ah, don't worry about it.' "
Ramírez takes phrases like that and wears them out. When Kevin Millar adopted, "Turn the page," Ramírez used it ad nauseam. As he walked around the clubhouse yesterday, Ramírez could be heard saying, "Five hundred home runs? Ah, don't worry about it." The other day when Jacoby Ellsbury was caught stealing on a pitchout, Ramírez started in on the rookie. "I've never been caught stealing on a pitchout," said Ramírez. "I would never try to steal a base on a pitchout. What were you thinking?" Ellsbury just laughed. "He's pretty special," said Ellsbury. "It's pretty neat to be on a team with a guy who's about to hit No. 500. There's probably no more than 30 to ever do it. We kid around quite a bit. We have a great relationship. I joke around with him a lot, and he's the type of guy that keeps our team loose. I think the great thing about him is that he has such a great time playing the game. That rubs off on the team." Ramírez is rarely overpowered by a pitcher. He, like anyone else, is vulnerable to someone throwing in the high 90s up and in. Seattle reliever Brandon Morrow was able to strike him out in the eighth inning Tuesday night, but as Lowell pointed out, "Even with something like that, the next time [Ramírez] faces him, he'll hit him. He'll find a way to make an adjustment so that doesn't happen again." Ramírez is often seen kidding around with Julio Lugo. For the last couple of weeks, he's been talking to Lugo about having an agility contest in which they try to chase a chicken. Ramírez joked that maybe it would help Lugo's defense. Ramírez also has a running joke with manager Terry Francona, who occasionally sends in a defensive replacement for his left fielder in the late innings. Ramírez played all nine innings in Tuesday night's 4-3 loss, about which he said, "I was surprised. I got to play nine innings." Ramírez often complains that there's no way he's going to win the Gold Glove if he isn't allowed to play nine. As the Mariners were taking batting practice last night, Ramírez went over to the cage where Richie Sexson, a former teammate with the Indians, was taking some swings. Ramírez impersonated the 6-foot-8-inch first baseman's stance, producing some funny visuals. Before this trip, Ramírez said he didn't want to hit No. 500 at home, instead wanting to do it on the West Coast. Last night, he amended that to doing it in Baltimore, where the Red Sox begin a four-game series tomorrow. When told by a reporter that the feeling was he was going to do it in Seattle, Ramírez said, "I don't know. It's too late. Nobody would see it." One homer away, and a lot of people want to see him hit it. Teammates, who have kidded him for so long about being stuck in the 490s, are now realizing the next one is the big one. "I think we can all say we saw a teammate hit his 500th home run," said Lowell. "That means a lot to baseball players." And despite the joking around and everything that goes with Manny being Manny, you can tell deep down it would mean a lot to him, too.